I also took a quick shot of the Charon alongside a standard Leman Russ. It's a little shorter in height but the overall hull is a bit more bulky than the regular version. Finally I pulled out all the proxy/custom tanks and did a group shot. 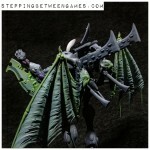 I'm planning on doing up another pair of the Griffons as well as at least another two of the Wyvern pattern Chimeras. Overall, another fun little project! That looks fantastic, mate - and I'm flummoxed as to how you could ever paint so quickly! Thanks Drax - my only 'secret' is drybrushing. Lots and lots of drybrushing. I can usually bang out a tank in an hour or so, though a squad of infantry takes me significantly longer to do. To be fair, I've been using this paint scheme long enough that I can almost do it in my sleep - Two greys on the main hull (shadow grey, fortress grey) followed by re-blacking any non-hull spillover, two browns on the tracks (dark flesh, snakebite leather), three reds for the weapon housings (dark flesh/red gore/blood red), boltgun metal on the metal bits, and after that it's just little dabs of color here and there on the detail work. I don't expect to win any painting competitions - I just try to paint to a reasonable gaming standard. If it looks good at arms length, I'm generally happy with it! What did you use to build the little guy at the lower left, w/the lascannon? That is a based on a Chimera kit, with the sides cut down by about an inch in length, and the inner hull cut along the driver's hatch side. There used to be a tutorial on how to build them on the GW site, it was called a "Scylla light tank". There's a thread on Warseer called "IG Tankette?" that has some links on how to build one.